There are many blockchain projects publicly touting their intentions of supporting the development of a thriving blockchain ecosystem across Africa. 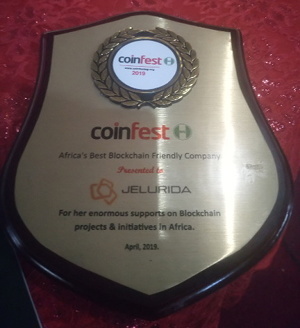 Adedayo Adebajo has been Jelurida's point person on the ground in Nigeria and after an incredibly successful hackathon at the Ahmadu Bello University in Zaria, Nigeria (the full report is covered by Nxter Magazine), his efforts were recognized by the Coinfest community with Jelurida receiving an award for “Africa's Best Blockchain Friendly Company”. The International Telecommunication Union (ITU) began a Focus Group on DLT Standardization between 2016 and 2017. The group is set to issue its initial reports and recommendations before the end of 2019 and, after several months of fine tuning the technical architecture for mapping DLT platforms, Ardor platform's architecture is set to be included in the reports appendix. Lead Software Architect Tomi Gountchev cracks John McAfee backed Apollo Project's “Privacy” Feature in < 24 hours. Apollo - Nxt clone and a project backed by John McAfee, claims to provide “Ultimate Privacy” for its users. In connection with this, Bitfi (hardware wallet provider also supported by John McAfee) presented a challenge to find out if the privacy feature works. The challenge, and another one, were both solved by Jelurida's software architect shortly after, and the faults of Apollo's privacy features were explained in details. It turns out that the only properly working privacy functionality that Apollo's code has, is the good old Nxt shuffling - a fully decentralized privacy tool pioneered by Nxt more than four years ago and copied together with more than 15 other well tested features by Apollo when their clone was launched. Use cases leveraging the blockchain can only become a reality if everyone understands the limitations of existing attempts to implement the technology. Following an introduction of the ITU DLT Focus Group's work on use case analysis, Jelurida's Lior Yaffe gave a keynote speech on three promising cryptographic techniques that could significantly expand the privacy capabilities of public blockchain networks. These two presentations were followed by a panel discussion on the state of enterprise use cases with IBM, UST Global, Liberbank, ISDI Business School, and Demetrius Consulting. Spain recently ranked as one of the top countries in Europe for entrepreneurs and tech startups – making it the perfect location for engaging serious Java developers in creating blockchain solutions with real utility. More than 20 Java devs showed up for one-hour seminar on smart contracts in Java with Lior Yaffe at the eDreams Offices in Madrid. The event ran overtime by a full hour, with attendees asking advanced questions on the feature's capabilities. Videos from the meetups are coming soon! Ignis has been listed on Bilaxy. Available trading pairs are IGNIS/BTC and IGNIS/ETH.